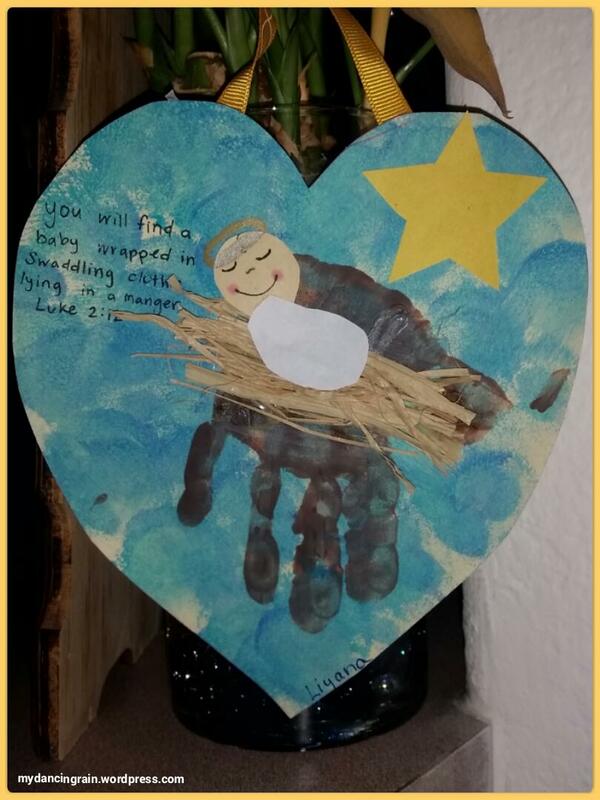 The gift of Jesus and this adorable DIY card my daughter made showcasing that special night long ago are two of the best gifts! Being a fan of handprint art, I had seen this art idea floating around Pinterest. I love it and am so glad that the awesome teachers at my daughter’s daycare took the time and care to help the kids make these as gifts for the parents! Last minute gift idea for teachers, mail carriers, barbers, babysitters, anyone! 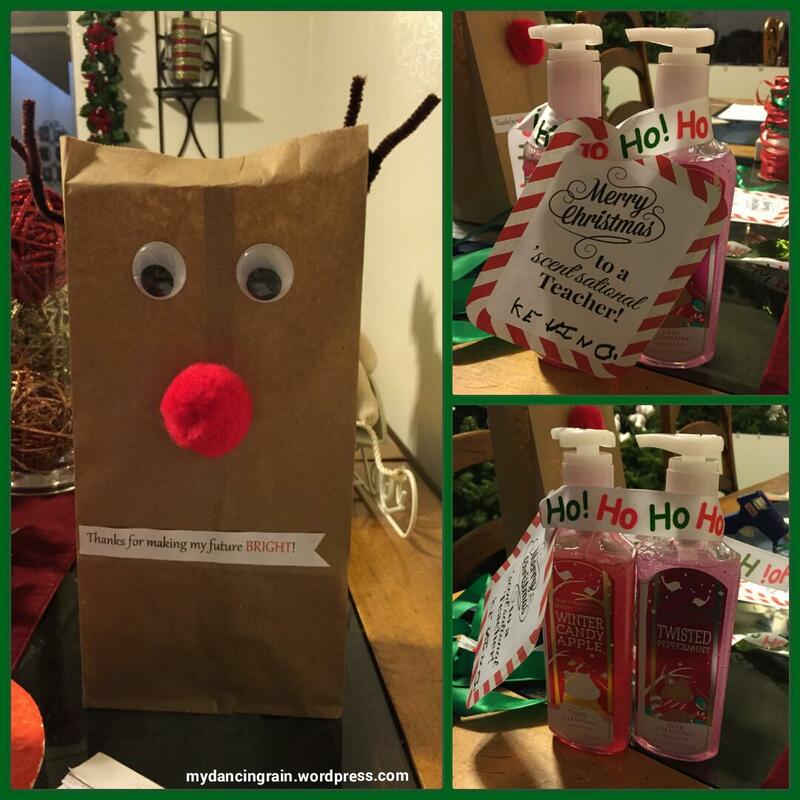 This low-cost DIY gift was made by my super creative and crafty aunt Gerri (a love of crafting runs in the family!) for her Jazzercise instructors. She isn’t even on Pinterest or any other social media site to borrow other peoples’ ideas. Her innate creativity is inspiring! 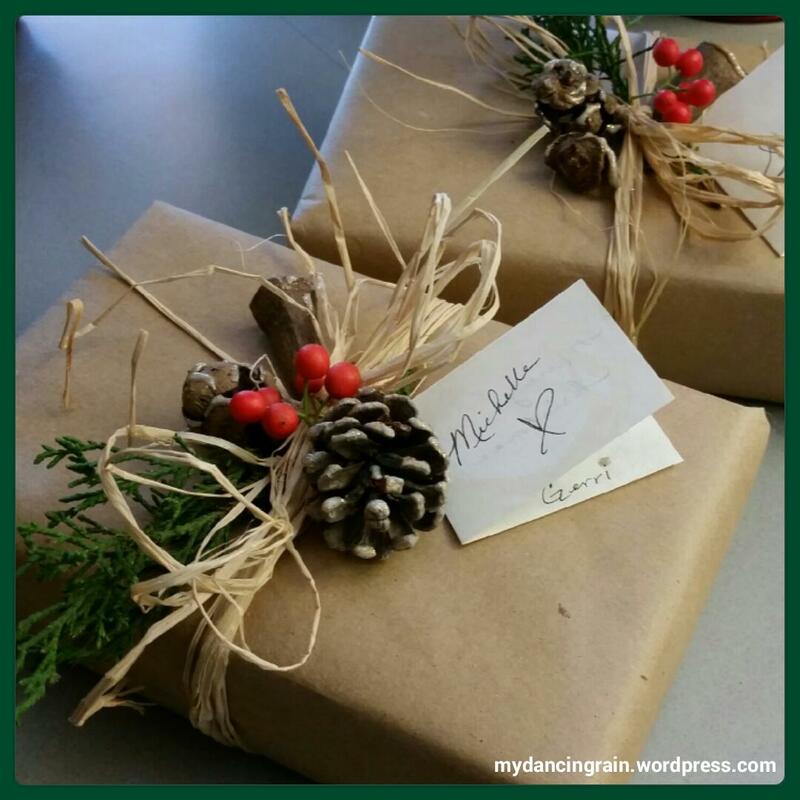 Each box contains 10 hot cocoa packets and a note saying, “A Christmas delight for a cold winter’s night!” She wrapped each box in brown bag paper, tied with raffia ribbon and decorated with a pine sprig, holly berries and pinecone. Very cute and a simple, last-minute DIY gift idea! As we go toddler-friendly on our Christmas decorations this year, l wanted a way to display my ornaments that were out of a toddler’s reach. I saw this idea on Pinterest, of course, and decided to give it a try this year. To make it, I wrapped two strands of dollar store garland and one strand of multi-color lights around an inexpensive tension rod. Then I decorated with a selection of ornaments that I really wanted to display this year. If you choose to use lights on yours, just make sure you have an outlet nearby that the little ones can’t access. Luckily my kitchen pass-through window worked well for this! I am so glad I found this idea. It only took about 30 minutes to make. And I am loving how it adds to my Christmas decor… far away from my daughter’s grabbing hands. Merry Christmas! As you start to receive holiday cards from friends and family, you can start thinking about what to do with those cards next year. 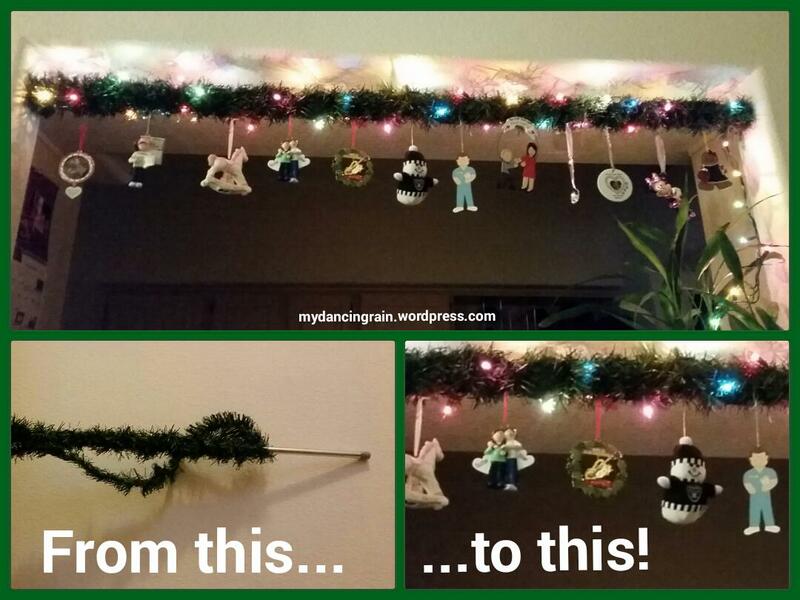 Don’t toss them; reuse them to make a garland! This is very easy to make and took about an hour from start to finish. 1. Gather all your old cards and sort through them to find cards with festive patterns and scenes. I chose not to use photo cards, but you could use them too. 2. 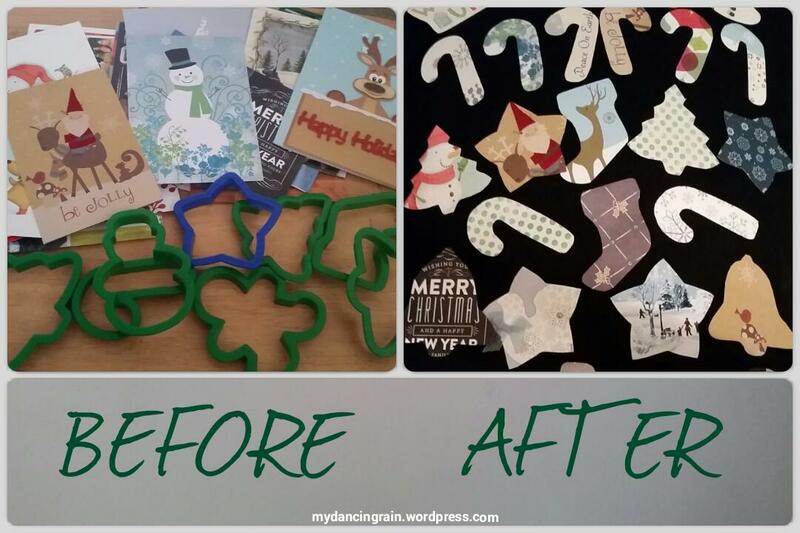 Use stencils of Christmas shapes, such as a tree, gingerbread man and woman, stocking, snowman, candy cane, bell and star. I used cookie cutters for my shapes. 3. Trace your stencils onto the cards. Make sure to include insides and backs of cards, as those usually have nice patterns to balance out your designs. 4. After you trace, cut out your shapes. This was the most time consuming step for me. But just put on some Christmas music and the time will fly by! 5. Next, string a ribbon where you plan to display your garland. 6. Attach ornament hooks to your shapes. 7. Hang the shapes from the ribbon variating the shapes as you go. 8. (Optional) I added an advent bible verse series to the back of each shape. To do this, I suggest printing out the verses and cutting and taping them to the back because some shapes may have a design on the back already and you wouldn’t be able to see the verse if written. If you are starting on this later in the season, or if you don’t have that many cutouts, you can also do a variation for the 12 days of Christmas instead of the 24 days of advent. Either way, it becomes a lovely DIY home decoration that also creates a new way to admire the beautiful cards from your family and friends! Who says money doesn’t grow on trees? 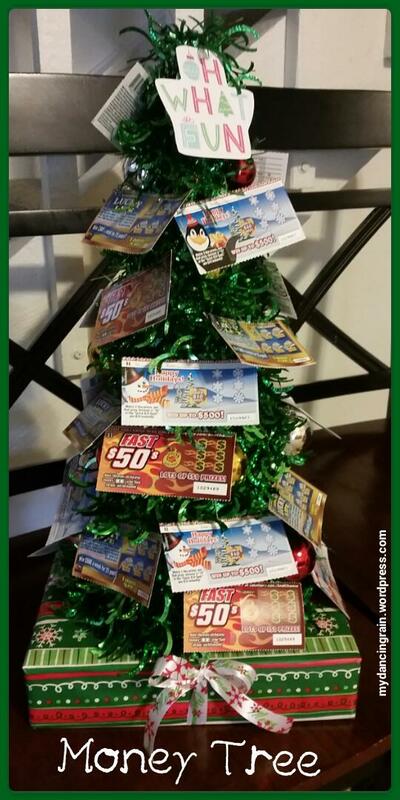 It does when you give someone a lotto tree! This is the perfect gift for that person on your list who always dreams of winning the lottery, or that hard-to-please person who has everything. Maybe they will win a little, maybe not. The fun part will be scratching off each ticket! I made this for my dad as a non-traditional advent gift, so he could scratch off a ticket each day of December leading up to Christmas. The tree is an inexpensive pre-made tree with a hard plastic frame that I found at a hardware store. I got 24 $1 scratchers and taped ornament hooks to the back of each ticket to hang them from the tree. Very simple! I wrapped his actual present and used it as a base under the tree, using ribbon for tying the tree to the box. (Personally, I felt like I had to add a little present just in case he didn’t win anything, but it’s probably not necessary for everyone.) My dad was surprised to see all the scratchers and was even excited to use the tree as a little holiday decoration for his man-cave! Save a few toilet paper rolls for this one! Your kiddos will have fun painting the plate and toilet paper rolls to make this festive — and fire-less — advent wreath. We used orange tissue paper for the flames; just roll a strip into a point and place it in the roll. Hide the tissue paper until it’s time to “light” that week’s candle. We finished off the project with some cut out green holly leaves and red berries. Glue all items to the plate using white glue and let dry overnight. Makes a nice little decoration for advent! 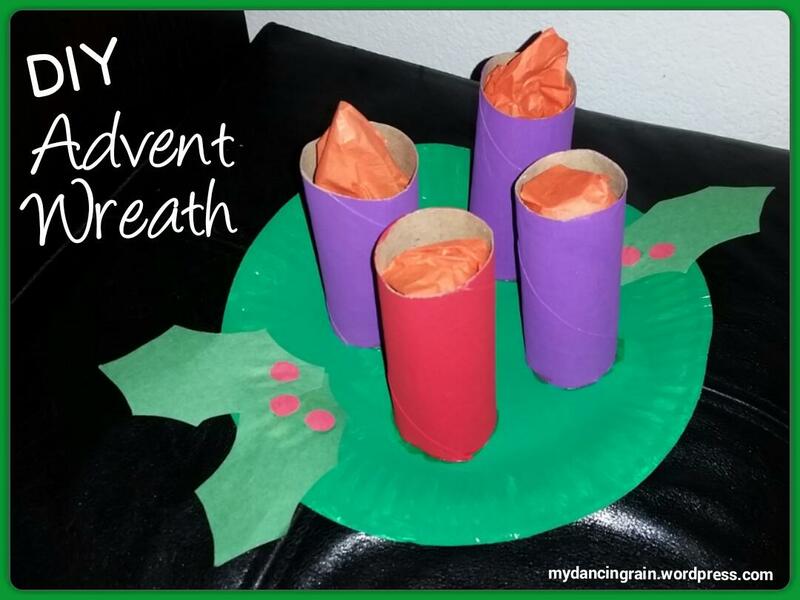 And is a great way to get kids involved in advent season activities! Looking for a fun use of all those toilet paper and paper tower rolls you have been saving? 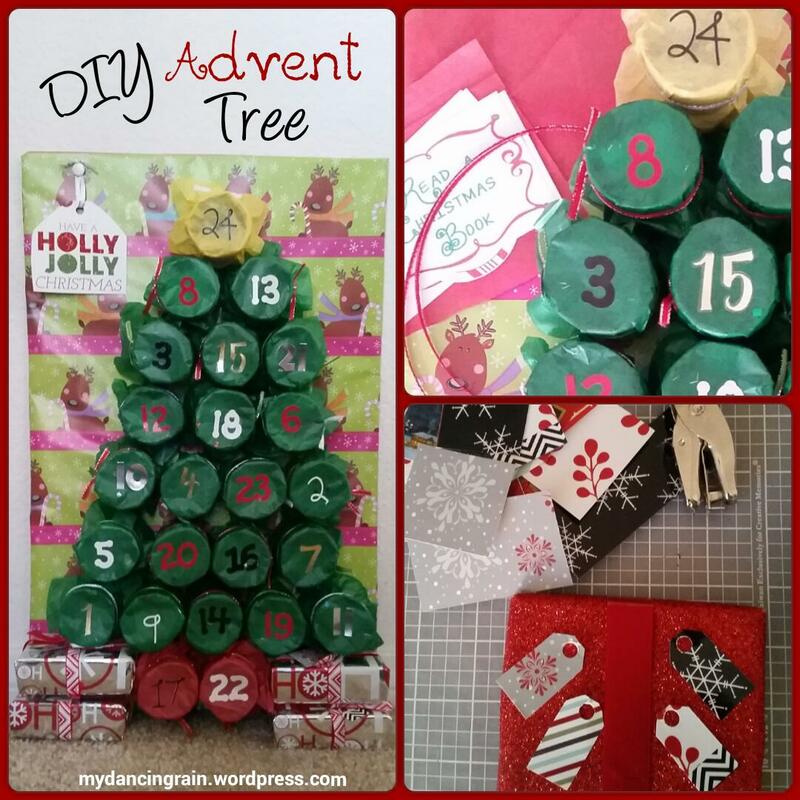 Use them to make an advent calendar tree with punch-out numbers to help the kids count down to Christmas. Kids will love looking for the daily number and punching it open to see what fun activity waits inside. 1. Cut the toilet paper rolls in half to maximize your supply. Then cut the paper towel rolls to match. Skip this is you have plenty available and want to have larger tubes for your advent tree. 2. Prep your tube wrapping materials. This includes cutting 24 strips of wrapping paper to wrap around the tubes. Cut 24 squares of tissue paper that will be used to cover the tubes. And cut 24 strands of ribbon, long enough to make small knots around the tubes. 3. Gather your numbers. I chose a variety of sticker numbers that I had on hand. Printing small numbers in different font types and colors could also work. You would just need to cut them out and have double-sided tape handy. 4. Prep your advent filling. I used this printable list of kid-friendly activities and folded them up inside each tube. Some days I included two activities, especially on weekends, because there were so many cute and fun ideas. As a variation, you could include candy, a Christmas joke, an act of kindness, a bible verse, or mix and match! 5. Prep your backboard. I cut a cardboard box (diaper box actually) to use as the backboard of my advent tree. I wrapped it using a different paper than I planned to use to wrap the tubes. 6. Assemble. This is obviously the longest step, but once you get into a rhythm it goes quickly. To start, wrap the tubes with the wrapping paper. Then cover one end with the cut tissue paper and tie with the ribbon. Add the number onto the tissue paper. 7. Add your filling (candy, activity, etc.) and secure the tube to the board to make a tree shape. I used white glue and planned out the best tree design to fit my backboard before I started assembly. 8. Repeat for all tubes, making sure to vary the number placement on the board as you build the tree shape. This makes it more fun for the kiddos to find the number each day. I chose to make the trunk and star on top part of the advent calendar, and used different colored tissue paper to create the look of the trunk and star tree-topper. 9. Optional: I made this advent calendar as a gift for my sister and her family. So I planned ahead and got their gifts to include as gifts under the tree. I purchased small gift boxes from a craft store and wrapped them in a contrasting wrapping paper. I made little nametags by cutting tag shapes out of patterns on old Christmas cards I have been saving — DIY gift tags is something I plan to do from now on for all my gifts! Then I taped the gifts to the board so they would be able to pull them off to open on Christmas Day. 10. Optional: I also included instructions for the advent calendar in the form of a wall hanging/gift tag that I affixed on the backboard next to the tree. I again used a fun saying cut from an old Christmas card and wrote the message on the back, making sure to let them know to wait until Christmas to open the gifts under the tree. I hope my niece and nephew enjoy this advent activity tree. Given that we won’t see each other very much this holiday season, I hope they will think of us each day they do their advent activity. I think I am going to ask them to send me pictures of them doing their activities too! 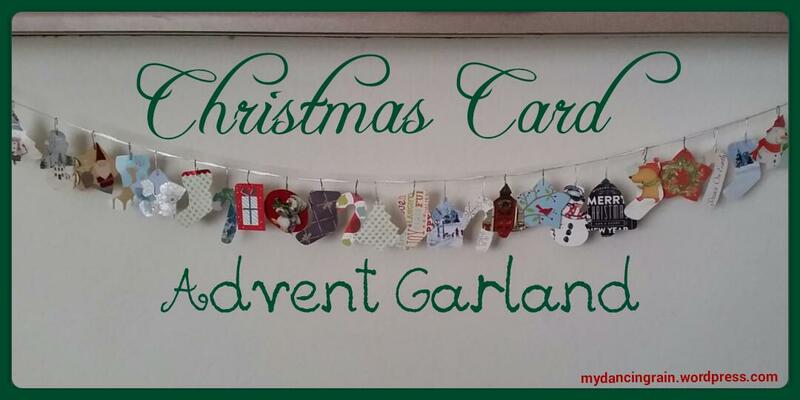 Happy crafting and have a blessed advent! 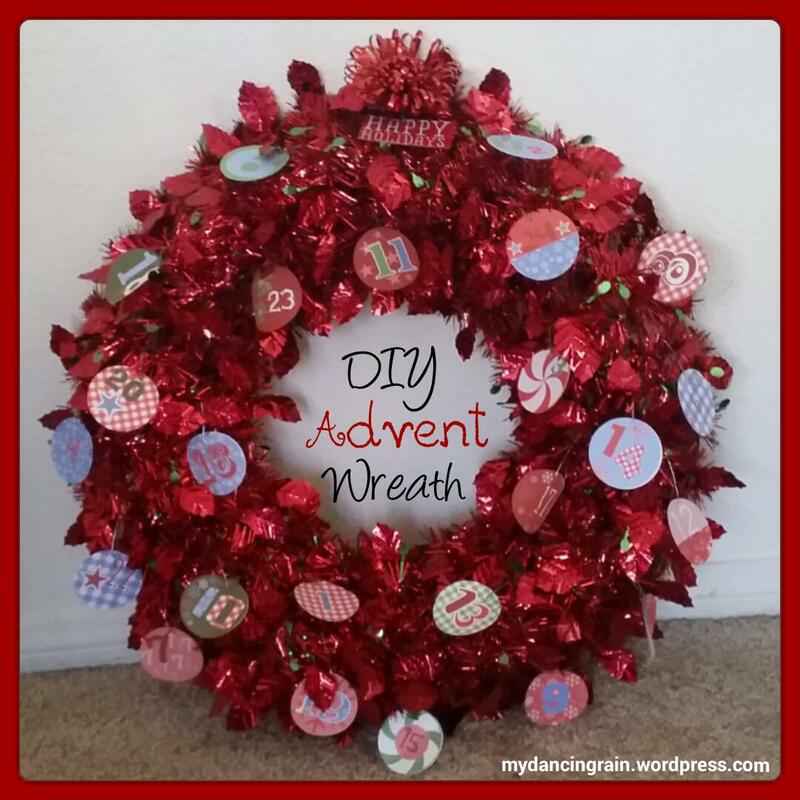 An advent wreath is a great twist on the typical advent calendar. It serves as a nice decoration and can be as simple or complex as you desire, depending on how much you want to make yourself. I went with the semi-homemade simple version… it features printed number ornaments with a daily bible verse written on the back of each ornament. To make it, I started with an inexpensive pre-made wreath bought from a hardware store (oddly enough). It has a thick plastic frame with red garland wrapped around it. Making the wreath could be a DIY project in itself, but I swallowed my ambition and chose to save time and buy the wreath instead. I found these lovely advent printable numbers, printed them and used my circle cutter to cut them so they will look like ornaments on the wreath. I also found this verse-a-day advent bible series online and wrote the daily verse on the back of each corresponding ornament. This could be varied depending on your advent plans. You could do an advent calendar with a daily holiday activity, a daily act of kindness, a daily Christmas joke, or mix and match. Then I cut small slits in the top of each ornament using a blade and hung them on the tree with silver and green ornament hooks that I found on sale. I scattered the numbers around the wreath to make it more fun to try to find the ornament each day. The ornaments are the perfect size for the wreath, not too big and overbearing, and look like little ornaments — just the look I wanted! What are you doing for advent this year? Please share your ideas and projects!